Heat oven to 400°F. Spray 8-inch square (2-quart) baking dish with cooking spray. 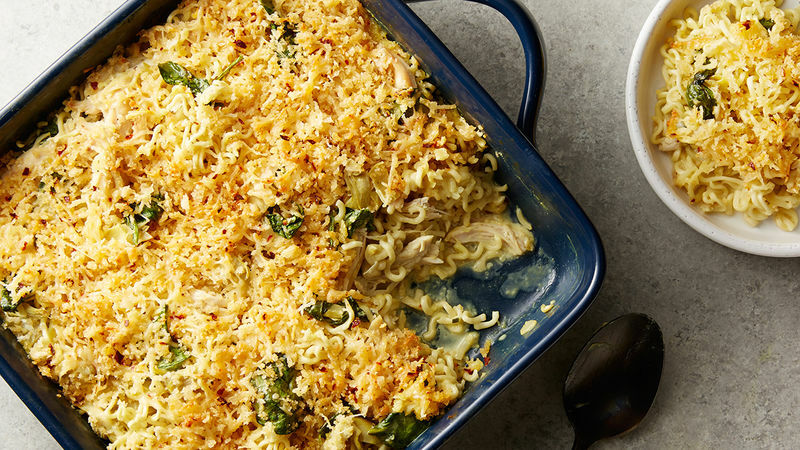 Place broken noodles in baking dish. Sprinkle seasoning packet over noodles. Top with chicken and cream cheese. Evenly cover mixture with spinach. Top with artichokes. Pour broth over mixture. Cover tightly with foil. Bake 25 minutes. Meanwhile, in medium bowl, mix Parmesan cheese, bread crumbs, pepper flakes and melted butter. Uncover and stir casserole. Sprinkle crumb mixture over top of casserole. Bake uncovered 12 to 15 minutes longer or until cheese melts and bread crumbs turn golden brown. Want to avoid the cutting board entirely? Cut up the drained artichokes using clean kitchen scissors. Don’t worry too much about breaking the ramen into perfect pieces. When in doubt, just make sure the ramen pieces are bite-size.